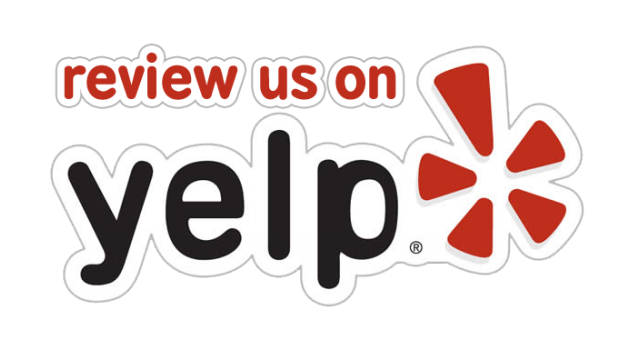 Looking for mobile pet grooming in or around Menifee? Call It’s a Dog’s Life Mobile Pet Spaw. Our mobile pet salon is perfect for all your dog and cat grooming needs. Kristi is an experienced and full-time professional mobile pet groomer. She loves animals and has loved taking care of them from an early age, so you can assure your pet is in good hands. Kristi has had professional training and is a certified IPG (International Professional Groomer). She’s also CPR and first-aid certified for your pet’s safety. She loves getting to know each and every pet as part of the close one-on-one time that grooming brings. With her mobile dog grooming and mobile cat grooming services you won’t have to plan your day around drop-off and pick up-times. In fact, once Kristi and your furry companion have gotten to know one another you won’t even have to be at home. For your four-legged family member there’s no stress, no crates, no cages, and no long boring waits away from home. 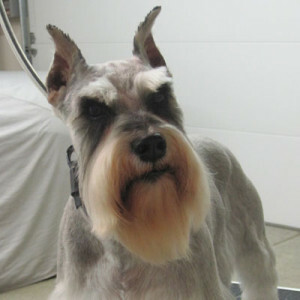 As every good mobile dog groomer knows, the best coat is very dependent on the breed and the owner. That’s why we recommend professional dog grooming every 4 to 8 weeks to keep your pet looking and feeling their best. Kristi can do breed-standard styling, including shave downs, puppy cuts, or overall haircuts. The aristocratic member of your family needs professional grooming about every 8 to 10 weeks to feel and look their very best. That includes basic brushing, minor dematting, ear cleaning, and a nail trim. 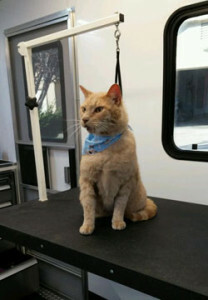 Our cat grooming services also includes lion cuts. Mobile pet grooming is especially beneficial for cats, which tend to stress out more when confined or in the presence of other animals. Whether cat or dog, your pet will leave our pet spaw pampered, happy, and beautifully groomed. It’s a Dog’s Life provides the best in mobile pet grooming. 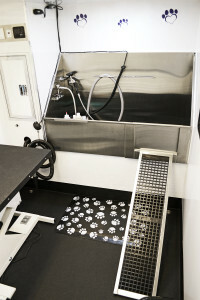 When you schedule an appointment we will arrive at your home in our sparkling clean state of the art mobile pet SPAW. It’s a full-service grooming salon on wheels, dedicated to your pet’s comfort and health. There’s no concern with Menifee’s climate. Our mobile pet spa is air conditioned and heated for your pets comfort, with plenty of hot water for a bath in our bathing station. Whether you need a mobile dog groomer or cat groomer, your pet’s welfare and comfort are top priorities. Even our “basic” package meets all the needs of most canines and felines, and pampers them with all the care and attention they deserve. It’s no exaggeration when we say that our bathing service is a hydro-massage with natural shampoo and conditioner. For health and appearance our basic package also includes teeth brushing, minor fur dematting, a sanitary shave, and special cleaning around the eyes and ears. To complete the spa treatment your pet receives nail trimming, a facial, fluff drying, light brush out, and a bit of fragrance. Our additional services can include light- and feather-trimming around the face, feet, tail, and legs as well as nail polishing or maybe even adding a little color to your furry companion. We also provide flea and tick baths and can take care of de-shedding when needed. Named after Luther Menifee Wilson, who discovered a quartz lode that lead to mining in the 1850s, the area didn’t actually become a city until 2008. Growth really began in the 1960s with the master planned community Sun City by Del Web, the same contractor responsible for the Arizona city of the same name. Some 8 miles north of Murrieta, Menifee has a population of around 83,000 residents and this is expected to reach 100,000 by 2020. It Is A Dog’s Life proudly serves all Menifee for their dog grooming and cat grooming needs. Our mobile pet spa is a convenient alternative for any pet owner in Menifee, California. Give us a call today.